When you feel responsible for the family, you know what to do — to go and apologize. Quite another matter – a sense of guilt before God. How and what words to ask for forgiveness from the Lord? Before answering the question of how to beg forgiveness from God for their sins, you have to understand where the feeling of guilt. Is it the guilt through repentance, which always call upon the saints? It is noticed that severe condition, when you want to turn to God, arise not from the mind (that is, not in those moments when you realize that technically violated any provision of the commandments), and spiritual intuition. When hard becomes the reason and soul. The saints call it the state of "rupture" of the soul with the Lord. And sin, the Holy fathers do not define as any formal offense for which the person should be punished. This perception of sin very shallow and more typical of Catholicism. Sin the notion of the Holy fathers is the gap of the soul with God. It is an act that deprives a person of harmony at the deepest level. The saints were able to listen to yourself and your soul very well and "caught" the sins in the Bud. People living in the world, realize that in the soul there is no harmony, it's too late, only when there comes a state when the handle is no longer in a coma. In this state, you want to ask God for forgiveness. To repentance there are two approaches. The first approach is characteristic of Russian Orthodox tradition is repentance rather emotional, which is best denoted by the word "contrition". But many saints say that by themselves, the sorrow and weeping is not repentance. What's really "forgiveness of the soul occurs when the soul finds the determination to live a new life. When a person is in their actions getting on a new track," decides to start a new life. 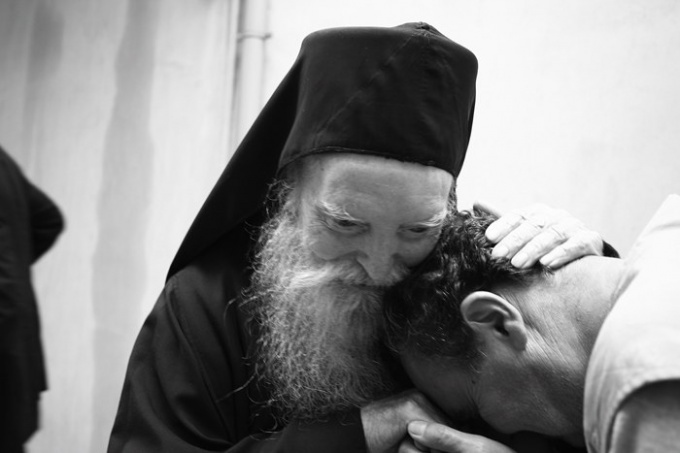 In the Greek tradition (which in ancient Russian Orthodox tradition, and is considered in the Orthodox world, a kind of benchmark) repentance is perceived no longer as a crush but as a determination to start to live differently. Even the word "repentance" the Greeks called "metanoia" is translated into Russian language of "rebirth," "change of mind". According to the Greeks, a strong determination to continue to do so, as before, and begin to live according to conscience and God's Harmony is the best repentance, and the best purification of the soul. Those who have decided to embark on the path of repentance, can be given a few simple tips. Start going to Church if you previously have never done, or, more often, attend Church services, if used to do it 1-2 times a year. Sometimes not stopping for some time to go to a secluded place, for example, in some quiet monastery, where you will be able to think about my life, to reconsider some things. Do not neglect the Sacrament of Confession in the Church. If you've never been to confession, don't hesitate to ask the priest to tell you how there is a Mystery. Actually, the very word "forgiveness" the Lord is best defined as the restoration of harmony and communication with God. This is the best forgiveness. And it seeks not only tears and prayer, but also a strong determination to change yourself, your mindset and your life. Where the desire and faith that there is God's forgiveness.